Have a berry happy day! 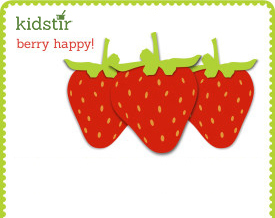 Print up this berry pun to add some fun to a summer day – and have some berries! We’ve got a quick & healthy summer snack – with a flag made out of berries – berry good kebabs! Use some fresh, seasonal berries as a healthy summer treat. How about some “Berry Good Crepes” for some breakfast treats. Serve up some crepes! The batter for these thin pancakes can be mixed up in a blender quickly. Roll them up with fresh berries and sprinkle with confectioners’ sugar. Ingredients include: milk, eggs, butter, sugar, vanilla extract, salt, flour, confectioners’ sugar and optional maple syrup. If you want a great drink, how about some strawberry sun tea? How about a berry great lesson on how to choose and store Strawberries? Choose shiny, plump red strawberries with bright green leaves. The smallest are the sweetest! Buy organic strawberries, if you can. They’re grown without pesticides and are much better for you.